According to the United States department of energy, heating and cooling your home accounts for about half of your energy consumption. That’s huge! A smart thermostat can help you gain better control over your homes heating and cooling operations and ultimately save you money! Plus, they’re really cool. Smart thermostats will learn your heating and cooling preferences and your schedule to optimize your system’s run time. 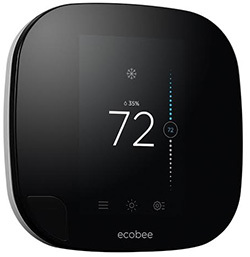 Our favorite smart thermostat, the Ecobee3, even comes with wireless sensors that are placed throughout your home to monitor temperature and occupancy. The thermostat uses that information to provide for more even temperatures through the home and use less energy. We have achieved some fantastic results in our clients’ homes with smart thermostats. Often, we are able to achieve as little as a one-degree temperature difference between floors. Almost all smart thermostats enable you to download an app for your phone that you can use to monitor and control your system from anywhere. Have you ever been lying in bed comfortably and wished you had a remote control for your thermostat? You can just pick up your phone now and adjust your comfort settings. Another benefit of smart thermostats is the ability to be notified remotely if there’s a problem with your HVAC system. If you have your heat set to a certain point and the thermostat sees that the home is not warming up, it will email you a notification. It can even send a notification to Air Dynamics to let us know you need help. Some standard programmable thermostats can be tricky to program properly, and if the battery dies, you may have to re-program your thermostat again. Smart thermostats can be programmed easily, online through you online portal. You can track your month to month run-time statistics and the software can even tell you how efficiently your system is operating.